Photo source: Copyright © International Mission Board-SBC. Used with permission. Romani groups are often thought of as wandering bands of peddlers and fortune tellers traveling from place to place in colorful caravans. But this is not always an accurate picture, as many of the world's Romani can be found settled in India and the Middle East. The largest group of Romani in India are the Lambadi (or Gormati). Other groups living there include the Tamil Nomads, the Indian Romani, the Kanjari, and the Baiga. Although these groups are spread throughout India, most of them are concentrated in such areas as Punjab, Madhya Pradesh, Uttar Pradesh, Madras, Orissa, and Andhra Pradesh. The Arhagar Romani also live in neighboring Pakistan and Bangladesh. These groups, as well as other Romani around the world, are linked linguistically. All of the Romani languages belong to the North Indo-Aryan language family. When Romani began traveling from India to different regions of Europe hundreds of years ago, different dialects of their language (Romany) emerged. Each dialect became classified by the region in which a particular group settled. Most Indian Romani have olive skin, dark hair, and brown eyes. Many believe they are descendants of the Rajputs of medieval India. These were a people who had been expelled from their homeland by Muslim invaders. They were used as grain-carriers and weapon-makers for Muslim troops. The Rajputs wandered throughout India and beyond, as a destitute, ignored, and misunderstood people. Their only valuables were the tools used in their specialized professions. 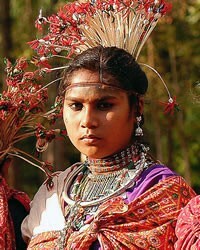 Today, their descendants, the Romani, are widespread throughout India. They have maintained a mystical lifestyle that keeps them somewhat socially separate from their surrounding communities. Not only do the Indian Romani usually have more than one occupation, but they also use additional skills to supplement their incomes. Some specialize in making such items as broomsticks, iron tools, and needles. They may also repair tool or work with stone. Other Romani are Hindus who believe that one does not have to work for a living, but may gain income by "religious begging." They sing songs and wear special make-up while begging in the name of a specific deity. Acrobats, magicians, tricksters, story-tellers, fortune-tellers, and the like may also polish cattle horns or work as blacksmiths. Some groups have even developed the art of tattooing. Nevertheless, these various occupations are used only when the region's people have a need for them. A Romani will change occupations and activities, adapting to a changing society's needs, because they depend on the people in that society for their livelihood. A Romani will only settle down when he cannot adapt to the needs of the region. Some of these "settled" Romani now live as farmers. While some Romani travel throughout the year, others travel only part of the year, returning to their home camps periodically. Some live in houses similar to those of the region, but many use their wagons or bull carts as dwelling places, and some live in mobile homes. Few travel by foot or on horseback, since they cannot afford such luxuries. Typically, Romani have very unclean living habits. Sanitation and good hygiene are rarely practiced. Indian Romani believe that babies are to be born "into the lap of mother earth." For this reason, a woman will have her baby while lying on a rug on the ground. Children are often poorly cared for; their hair hangs loosely and shoes are seldom worn. Most Indian Romani are Hindu. Others have combined many Hindu practices with their own beliefs. Two groups, however, are Muslim. The Arhagar Romani practice Islam because they live in Pakistan, a Muslim country. The Indian Romani have simply continued to observe the practices of their Muslim invaders of long ago. Romani often follow folk beliefs and mixed with these religious beliefs are many taboos. One taboo among the Hindu Romani is that a woman's hair must not be combed or let down long in the presence of men. Another is that a woman should not pass in front of a man who is sitting, but rather behind him. Even though Romani are unreserved in speech, many have high moral standards. For example, chastity is very important. In the past, some girls who were involved in prostitution were buried alive. Unmarried girls are still discouraged from going into the cities, and they usually wear veils over their hands and feet while sitting with strangers. Many Romani live in poverty. Usually the only clothes a Romani owns are the ones on his back. An unsanitary lifestyle has created many physical needs among them. The quality of health care, nutrition, and education is poor. Most children do not attend schools because their families are always on the move. Adequate educational opportunities must be provided to raise their standard of living. Most importantly, these Romani are spiritually poor. Christian broadcasts and Scriptures must be made available if they are to hear the Gospel. Christian workers are needed to teach them how to live lives pleasing to God. * Ask the Lord to call people who are willing to go to India and share Christ with the Romani. * Pray that the Romani who have found Christ will be bold witnesses to their own people. * Ask God to strengthen, encourage, and protect the small number of Romani believers. * Ask the Holy Spirit to soften the hearts of Romani towards Christians so that they will be receptive to the Gospel. * Pray that God will give missions agencies strategies for reaching the Romani.View Baiga in all countries.